Oh my, what a wonderful card for those Germans. This coming weekend we are going to visit some German friends and this digi would be perfect. You made such a wonderful card. Lynn, I hope you make it to Germany some day, too! 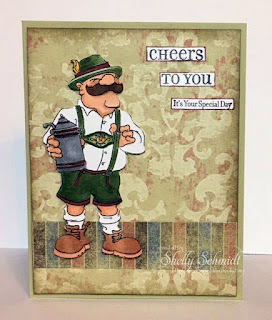 What a fun card... love the layout and that fun guy, too! Wonderful card, Shelly! Love that image. The "ancient" paper is a nice touch. I guess paper never really goes out of style. I am trying to re-surface after getting home on Sunday. It's been hard getting back into routine. I did get my kit when I picked up the mail so I'm looking forward to playing with it. Haven't found the time yet to get over to SCS. Have a wonderful day! This guy brought a huge smile to my face, Shelly!! I, too, have German ancestors!! The papers you have used here are so perfect for with fabulous design!!! Awesome masculine card! Love your card! A fun image and colored so nicely. I like the background paper too....perfect match! I fell in love with this and your coloring as soon as I clicked on the thumbnail at SCS. OM word!!! Please go visit Germany. I used to live there and then took my hubby and girls back to show them the beauty, food and music (and beer lol)!! !